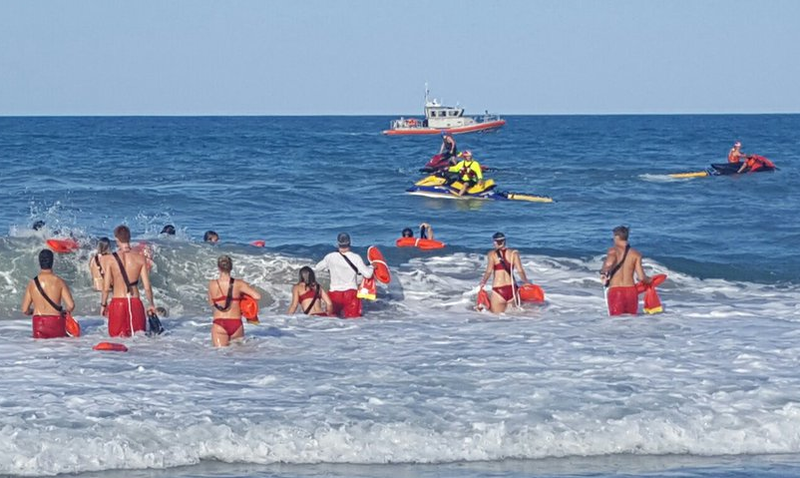 MELBOURNE BEACH, Florida - Brevard County Ocean Rescue lifeguards, along with other agencies, have recovered the body of a swimmer who went missing off the coast of Melbourne Beach, Florida. Just before 4 p.m. Sunday, the beach at North Spessard Holland was cleared due to thunder and lightning in the area. Beachgoers were asked to seek shelter. At about 4:30 p.m., lifeguards responded to a 53-year-old swimmer in distress. Once the swimmer was brought out of the water, CPR was performed and lifeguards began medical resuscitation and were able to get a pulse. The victim was transported to Holmes Regional Medical Center in Melbourne, Florida. At about the same time, a lifeguard went out after two other swimmers who were caught in a rip current and discovered a third swimmer was submerged. A search and recovery effort ensued involving more than 30 rescuers. Mutual aid was also provided by Brevard County Sheriff's Office, Florida Fish and Wildlife Commission, Indialantic Fire Department, Melbourne Beach Fire and the U.S. Coast Guard. At 6:45 p.m., Ocean Rescue recovered a body 35 to 40 yards from the last seen location. The victim was identified as a 20-year-old man from Kissimmee, Florida. Although Tropical Storm Bonnie missed Florida's east coast, the storm generated ocean swells over Memorial Day weekend that elevated the risk of strong rip currents at Central Florida beaches. Brevard County lifeguards made 30 rescues on Saturday and 10 on Sunday. Last year, four drownings occurred off of Florida's Space Coast during Memorial Day weekend. Rip currents are powerful channels of water flowing quickly away from shore, which occur most often at low spots or breaks in the sandbar and in the vicinity of structures such as groins, jetties, and piers. Remember to swim near a life guard and do not swim alone. Ask the beach patrol about ocean hazards when you arrive at the beach. If you become caught in a rip current - do not panic - but yell for help. Remain calm and do not exhaust yourself. Stay afloat while waiting for help. If you have to swim out of a rip current, begin to swim parallel to shore. 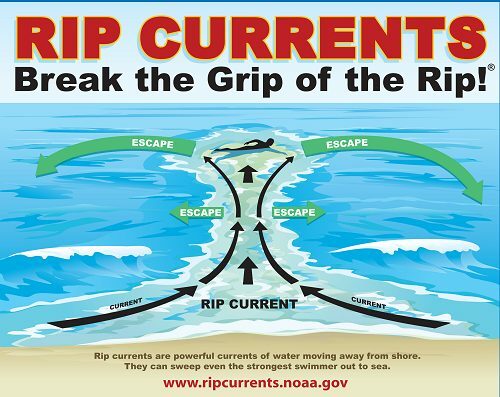 Once you are away from the force of the rip current, begin to swim back to the beach. Do not attempt to swim directly against a rip current. Even a strong swimmer can become exhausted quickly.